I can’t even begin to tell you how an ice cold Michelada has rescued me. It’s 11 a.m. on a Saturday morning. My eyes burn, stomach turns and even my teeth hurt. The only audible sound is the leaf blower from my neighbor’s gardener. Anything past 2 a.m. is a blur. Slowly, I crawl out of bed to wake up friends who are sprung out in the guest rooms. We gather in the kitchen for brunch. No one is cooking just yet. Michael reaches for the ice-cold Tecate, Lu pulls out the Clamato, Worcestershire, and hot sauce, while I begin cutting limes and putting heaps of Kosher salt and chili powder on a plate to rim glasses filled with ice. Some people eat menudo for the crudo (hangover), but in our house, me and my friends drink what we consider the best hangover cure ever — The Michelada. We’ve come to love Micheladas as they are refreshing, especially when it’s hot outside. During the summer, my friends and I will go in search for that perfect Michelada only to come back home to make them exactly how we like them. And, I guess that’s the thing about Micheladas. Everyone has their favorite way of making them. People on the Internet or at parties get into lengthy arguments on the “right way” or “authentic” way to make one. In my mind Micheladas are a lot like life. There’s not one right way. If you travel throughout Mexico, you’ll find them prepared a little different depending on the region. And you know what, it’s okay to be different. The Origin of the Michelada – I read in an article that most sources date the invention of the Michelada to the 1940s or early ’50s. This makes sense because ice cubes are unlikely to have been common in Mexico much before then. There are two widely disseminated stories about the origin of the name. One has it that the Michelada was invented by a man named Michel Esper in the town of San Luís Potosí; the other claims that it was christened in honor of a Mexican general, Augusto Michelwho reportedly liked to spike his lager with chiles and lime juice. Both seem doubtful. 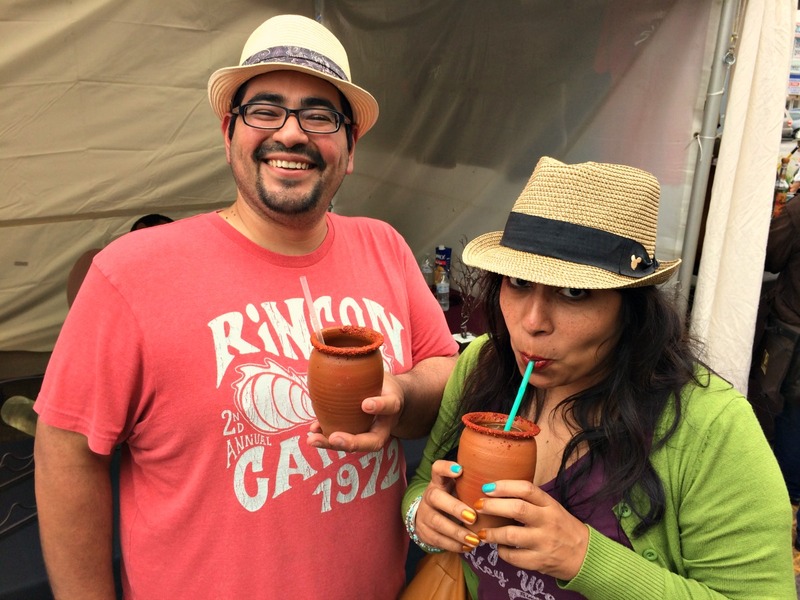 Recently, major U.S. beer producers have begun marketing cervezas preparadas, illustrating the wide variety of recipes in the Chelada/ Michelada category, and to serve the large Latin American population in the country. For example, Miller Brewing Company produces Miller Chill which is a “Chelada-style light lager with a hint of salt and lime.” Going a different route, Anheuser-Busch is manufacturing Budweiser Chelada and Bud Light Chelada as a combination of lager, Clamato, lime juice, and salt. I have to admit, I’m not a personal fan of any of these products. It just tastes fake. Has anyone seen or tried the new chili and lime rimmed styrofoam cups sold at 7-Eleven? 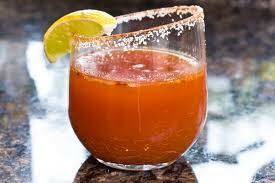 The michelada continues its growth in popularity and convenience. I am a fan of a local bar in Los Angeles called La Chuperia. Their micheladas are more like a meal with plump shrimp, chamoy, chile powder and a plastic straw wrapped with my favorite spicy tamarindo candy. Look below at this beauty! 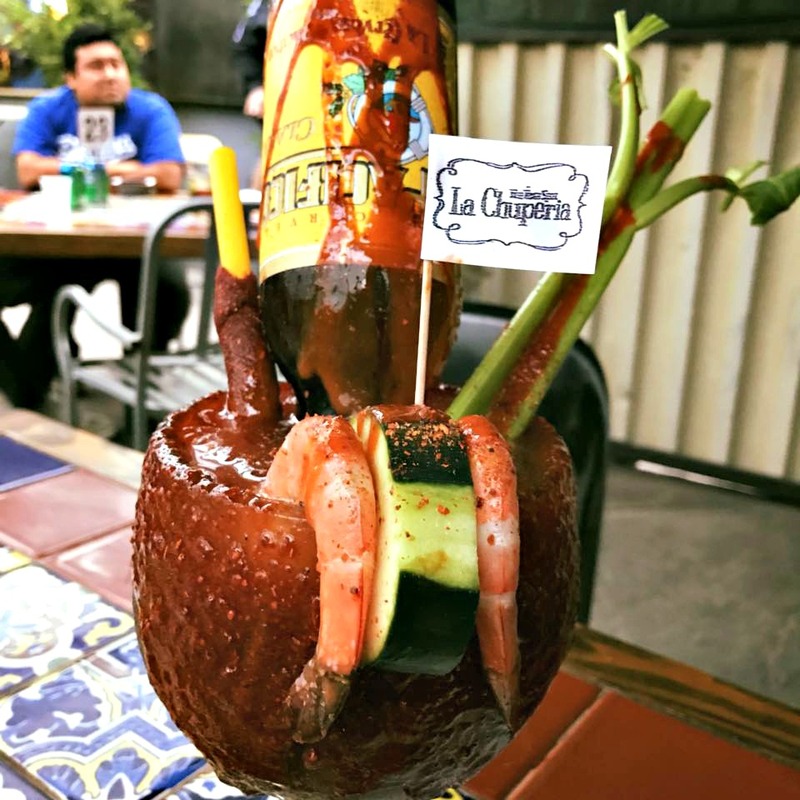 As mentioned, there are different types of Michelada recipes, such as in Mexico City, the most common form of a Michelada is prepared with beer, lime, salt, and hot sauce/or chili. Some do add slices of orange, but this step is optional. Rub the rim of a glass with a wedge of lime. Pour salt and chili powder on a plate wide and deep enough to dip the glass rim like a margarita. Squeeze the limes and pour the juice in the glass. Add Worcestershire, hot sauce, pepper and Maggi and mix. Pour the beer and enjoy! Love this recipe. Agree with you about tabasco- vinegar is definitely not good in a Michelada. The salt and chili on the rim of the glass is the icing on the cake. You write in your recipe to add Maggi, but it wasn’t in the recipe list. Do you add it to yours? Thanks for sharing such a good cocktail recipe. Yes, we add just a drop of Maggi for a rounded flavor. Thanks, Tony. Happy Weekend! Hi, I would like to clarify that this origin of the Michelada is actually wrong. My uncle Michel Esper invented it in San Luis Potosi in the “Club Potosino” around the 70’s or 80’s. In those times nobody drank beer with ice, they just drank it cold. So he started mixing it with ice and then added lime, chilli powder and other sauces and spices, and that’s how he made it. The bartender at the club called it “Michelada” in his honor, and when other club members started asking for it, that’s the name they called it by. Please research it in other sites to find out the truthfulness of the matter in order to correct it. I’m 100% truthfull, And just want to see him receive the real credit he deserves. Thank you so much, greetings! Thanks for sharing your story. We do mention Michel Esper in our story.